Sometimes you encounter situations that require you to color match a finish. 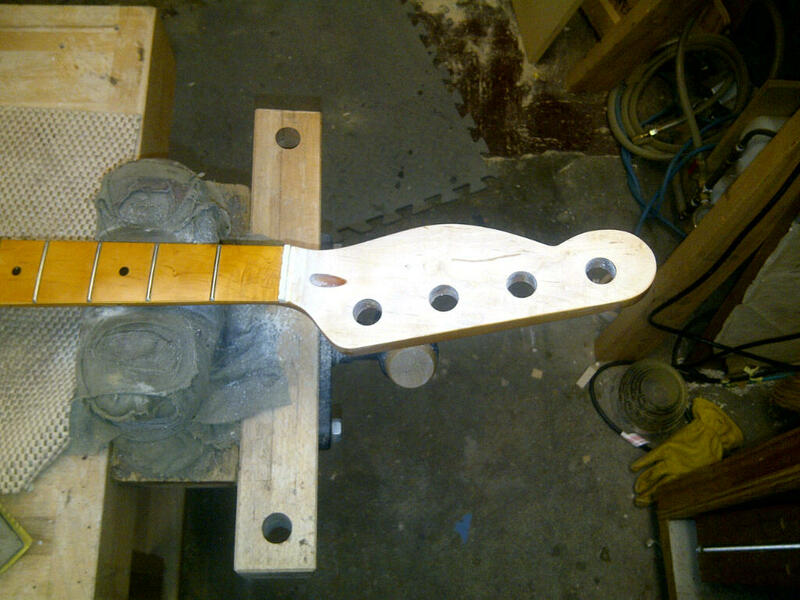 In this case it is with a bass guitar that had its peg head shape altered and the client wanted me to match the finish as close as possible to the rest of the neck. 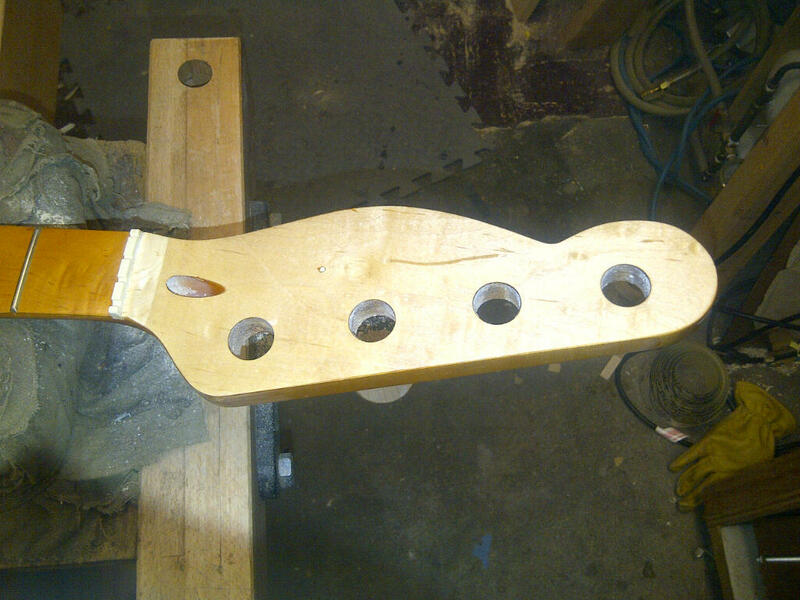 As you can see, the fret board (as is the rest of the neck) is a dark amber color, much darker than the rock maple. First, I sand to 220 grit to get rid of any scratches and prep the surface. In fact I do this even if there aren’t any scratches to make sure there is nothing contaminating the wood. Then I apply my sealer, in this case shellac. You can also use vinyl sealer, epoxy and sanding sealer but in this case it was handy. When it comes to shellac I try to always use flakes dissolved in alcohol with a date on it to make sure it’s fresh. I usually use a 3 lb cut as a sealer. This refers to 3 lbs of shellac dissolved in 1 gallon of alcohol. It lasts for about 6 months so I don’t mix more than I can use in that time period. It should be dry to the touch in minutes, and if it doesn’t it’s old and should be thrown out. The pre-made shellac in hardware stores contain too many additives such as plasticizers to maintain shelf life. An interesting thing about shellac is that it’s considered a food product by the FDA and it’s what coats M&M’s. I don’t like to stain bare wood for two reasons: One it looks blotchy. The soft parts of the maple will take more stain than the hard parts. Two, if I screw up the color, I can take it off easier. Here’s what it looks like with the shellac applied. I mask off what I don’t want finished and mix my color. I don’t normally shoot lacquer but in very small amounts I can get away with it (I’m allergic to the stuff). In this case I’ll be using TransTint dyes sold by Stew-Mac, amber, red mahogany and medium brown. Most of the color matching comes from practice. I’ve done a lot of these so I use my experience to make a guess as to the colors and ratios. In about 4 oz of lacquer I put 6 drops of amber, 1 drop of red mahogany and 1 drop of medium brown. It’s very important to make a record of this and keep it in a journal. This way you will be able to correct the formula if it isn’t right and repeat it if it is. I test the color on a piece of paper and in this case it was pretty close so I went ahead and shot the peg head. I do very light layers until I get the desired shade. As you can see, it’s a pretty close match. Next week, the finish coats. 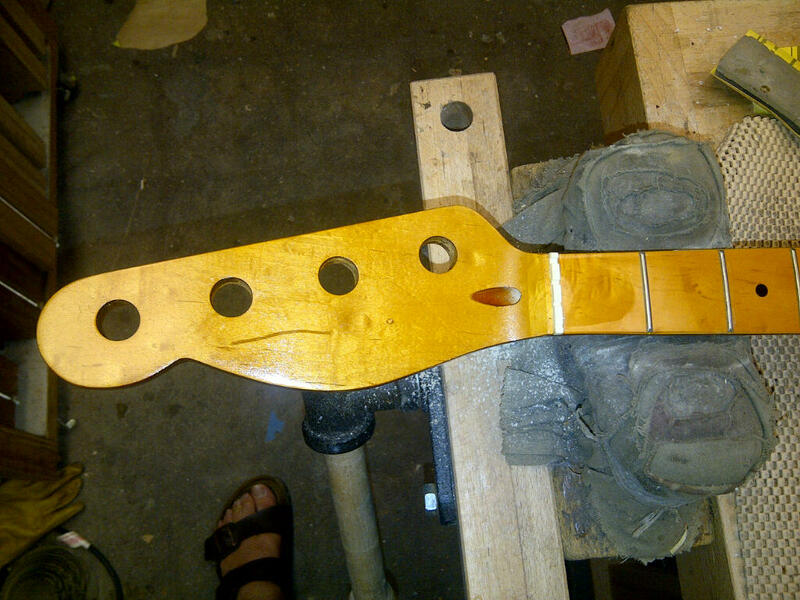 This entry was posted in Advanced Guitar Repair, Lutherie and tagged bolt on neck, color matching, electric guitar, Guitar finishing, luherie school, Lutherie, peghead, solid body, Stew-Mac by Geiger School of Lutherie. Bookmark the permalink.